There are just over a million people living in Montana, but this state ranks fourth by size in the whole of the United States. In fact, its large size is what makes it potentially great or all kinds of businesses. Because of the vast space of the state, it’s not a surprise that Montana’s economy pillars include agriculture and mining. Still, in the last couple of years, another industry has started growing super-fast. We’re talking about tourism! The reason for this is the breathtaking nature of Montana, which is bringing tourists from all over the United States, especially those from big industrial cities, who are craving for fresh air and tranquility. Because of this, it seems that starting a travel-related business in Montana is the right choice. But, you can’t do that without a proper business plan, something that requires getting a superb Montana businesses database. Apart from helping you with launching a business related to tourism, this database can serve as a guideline for literally any type of business, which is one of the crucial reasons why you should buy it. Furthermore, the database can also help you with many other things, apart from developing your business strategy. For Montana Companies database, we have a total of 55,280 Montana businesses listed. Usage: Montana Business Search, Montana ​​​Business Entity Search, Offline Marketing, Sales Lead Generation, B2B Partnerships and other Business related purposes. With a proper list of Montana companies in your possession, you will be able to research the market easily. On top of that, the same database could be your main tool in making favorable b2b deals. This is possible, because every Montana small business list should contain contact details that could get you in touch with the important people from each company. By important, we mean either the owners of the company or its management. Still, the number one reason why people decide on buying a list of Montana businesses is to promote their company. This is possible, because the databases come with contact details such as the email address, telephone and fax number, as well as the mailing address. You can use these details to start off a superb email marketing campaign, telemarketing campaign, start sending promotional brochures, etc. ​ Why Should You Choose Our Montana Companies Database? The main reason why our directory stands out from the crown is the fact that all of the 55,280 Montana businesses listed are completely genuine! Furthermore, we regularly check all the details, making sure they’re updated. Not only does this mean that the database will not cause you any unpleasantness, but you will also be able to use it for many years. This applies to our New Jersey, Vermont, West Virginia list of companies, every state database we possess are valuable. Apart from being large, our directory is also great because it’s full of useful info. First of all, it comes with all the necessary contact details for making business-to-business deals, but also for starting marketing campaigns. 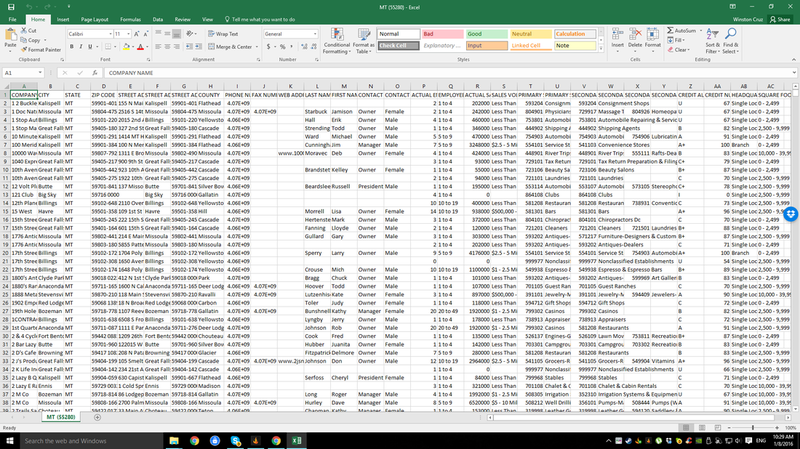 On top of that, the database comes with rather useful details about each company, including the actual sales, the SIC code and the number of employees. This type of info will help you learn more about your business rivals, so that you would always have an upper hand over them.